This exquisite figurine, from the Circle of Love range, will make a fantastic addition to any wedding cake. Featuring the groom figure romantically carrying the bride in her long flowing dress. 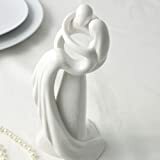 This porcelain figurine would also make an ideal gift for the happy couple. Infinite Love is a beautiful white wedding cake topper from the Circle of Love collection. Its elegant flowing shape portrays the all-encompassing nature of love and the engulfing sentiment shared by the couple. Made from the finest white porcelain, this 21cm tall figurine will look stunning as a wedding cake topper. It would also make a perfect gift between a loving couple or as an engagement, wedding or anniversary present to both of them. And it would be a wonderful addition to one’s home where it would evoke fond memories of the memorable day or the loved one. The contemporary range of high-quality porcelain from Circle of Love is designed by Kim Lawrence.Her distinctive gallery of contemporary and stylish sculptures portrays the emotive themes of love and family.